You find out who your friends are when you are in trouble. I have many good friends, but three years of illness means I’ve lost touch with a lot and those left are worn out. I have no close family or support from my son’s dad, no maintenance, I ran out of savings long ago and am now on nil pay. Anyone on a low income knows benefits have been hacked, wages kept low and social support decimated, along with the starving of local authorities. A lot of our old ways of pulling ourselves out of the crap are also gone. What I didn’t know before my illness was the toll this can take on people with disabilities or long-term chronic or terminal illness. You lose income, while your costs go up and it’s all new territory, often on your own. When you are feeling like crap. Taxis to medical and occupational health appointments, school meetings (when you used to walk), extra heating and laundry, childcare, the fact that you can’t shop for food bargains or cook from scratch, and so on. And even if HR tells you it’s worth exploring whether you are eligible for disability benefits, the chances of receiving PIP (Personal Independence Payment) are slim these days. So money worries add when you should be focussing on your health. UNISON helped me when I was first ill – a winter fuel grant in 2015 – and after the stress of redeployment, my union representative found out we hadn’t had a holiday in years, so helped me apply for funds towards a short break. I had been years on a zero hours contract and I really appreciated it both times. I didn’t even think of asking again. It was only when my rep advised me at an HR meeting after I was in and out of hospital that re-applying came up. She helped me get the application done, too. I was exhausted and the form was terrifying. In the end I received a cheque just before Christmas to help with childcare while I was in hospital, parking fees for a friend to bring my son to visit, some replacement clothing and extra living costs to help with fuel charges and taxis etc. Covering those unexpected costs meant we could concentrate on celebrating being home at last. I’ve come a long way and I cannot say how grateful I am. I am trying to help myself and it has been hard to be ill, but harder to be relying on other people. Sometimes you do feel like a burden – especially as a lot of the systems that used to be in place are gone and the benefits system can be humiliating. But the best bit about this experience is that I feel part of something again. 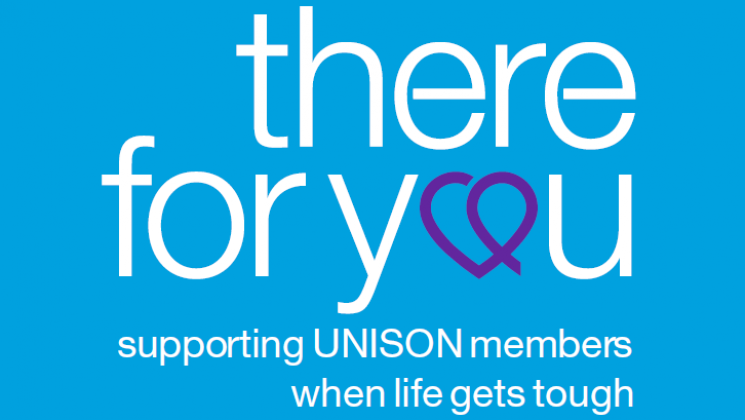 I hope I can use my experience to let people know that UNISON might be able to help you in times of sickness or financial trouble. You just need to contact UNISON There for You on 020 7121 5620 or contact the branch to find out more. And if you or anyone you know needs to prove how being in UNISON can really make a difference in these difficult times, please remember my story. It’s another example of the security that comes with having friends like UNISON on your side.